Cover Story (view full-size image) This issue of Proceedings collates papers presented during the 2nd International Cell Death [...] Read more. This issue of Proceedings collates papers presented during the 2nd International Cell Death Research Congress (Izmir, Turkey, 1–4 November 2018) organized by Cell Death Research Society of Turke. The collection presents contributions on a total of 16 topics: aging and senescence; cancer; immunity; inflammation; signaling pathways; systems biology; genetics and epigenetics; drug delivery systems; cell stress and metabolism; types of cell death; stem cell; survival mechanisms; vascular processes; diseases; new tools in cell death research; and targeted therapies. 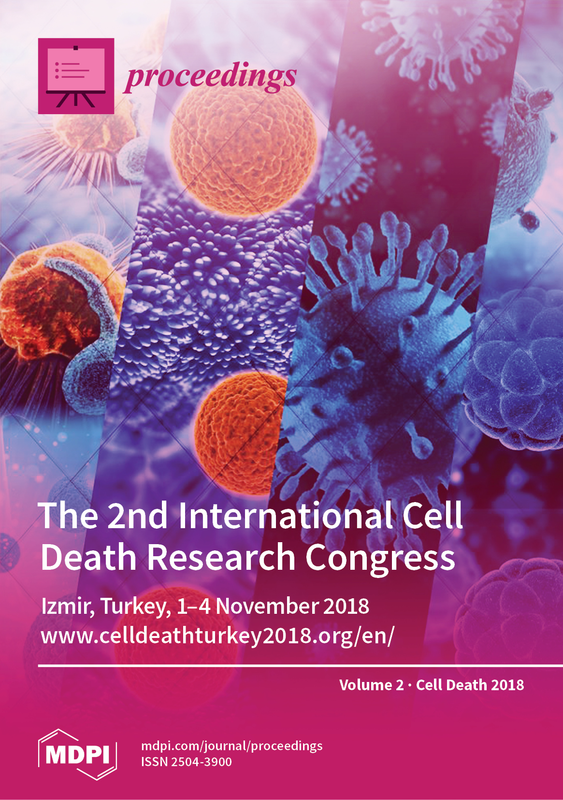 International Cell Death Research Congress 2018, the II edition of the conference series, was held in IZMIR at Wyndham Grand Izmir Özdilek Hotel, from November 1 to 4, 2018 for the second time in Turkey, after Izmir 2016. This conference series were organized [...] Read more. In the study, we aimed to show the role of autophagy which acting as a seesaw between apoptosis and necroptosis increasing and decreasing changes in certain vital organs under effects of envenomation by Mesobuthus nigrocinctus and anti-venom administration in mice. In group [...] Read more. Flavonoids have chemo-preventive and chemotherapeutic properties against different human cancers including chronic myeloid leukemia. Quercetin and curcumin are two polyphenols with potential anti-carcinogenic and pro-apoptotic properties. We have previously demonstrated the synergistic protective effect of quercetin and curcumin on chronic myeloid leukemia cells [...] Read more. Gastric cancer (GC) is one of the most prevalent malignant types in the world and an aggressive disease with a poor 5-year survival. GC is the third greatest global cause of cancer-related deaths. It is well recognized that tumor heterogeneity, a fundamental feature [...] Read more. Fas is the receptor of tumor necrosis family receptors (TNFR) and involves in apoptosis. Since discovery of T helper 17 cells (Th17) in 2005, which are defined as a new type of helper T cells, it has become clear that the dysregulated function [...] Read more. Breast cancer is the leading type of cancer in women. The majority of cells in the diagnosis of breast cancer are estrogen receptor alpha (ER α) positive and the growth of these tumors is due to estrogen. Tamoxifen is used as a supportive [...] Read more. In this study, the fruits and leaves of wild blueberries grown naturally in our country will be evaluated by using different infusion and boiling methods. Blueberry teas; leaves, raw fruit, dried and shredded raw fruit, fruit beans and seedless raw fruit of different [...] Read more. Premature Ovarian Failure; is characterized by the dysfunction or early depletion of ovarian reserves due to follicular loss in the ovary in women under age of 40. POF is the important cause of infertility and its etiology is still not clearly understood. Investigation [...] Read more. Neuroblastoma (NB) is the most common extracranial solid tumor in children with incidence rate 10.2 per 1 million children under 15 years old. NB has great diversity in clinical behavior while some tumors are easily curable and spontaneously regressed, the others are resistant [...] Read more. The objectives of this study are to identify changes in gene expression, which involved in apoptosis pathways induced by gamma radiation, Cervical cancer cells were exposed to various doses of a single fraction of gamma radiation. After incubation for different periods, the proliferation [...] Read more. In both healthy cells and cancer cells a number of different cellular responses influence the progress of cancer. In this study, we have investigated the effect of stress conditions on human hepatocyte cancer cells. Different concentrations of hydrogen peroxide, quercetin and N-acetyl [...] Read more. Acute myeloid leukemia (AML) is the most common form of acute leukemia and the overall 5-year survival in AML patients is 40–45% in young patients and less than 10% in elderly patients. Therefore, there is still a need to improve therapeutic approaches. After [...] Read more. Breast cancer is the most common female death in women. Different studies are being done for treatment. The aim of this study was to investigate the antiproliferative, apoptotic and antioxidant effects of oleuropein and vitamin D both individually and in combination. Apoptosis is [...] Read more. Hematopoetic Stem Cell Transplantation (HSCT) has benefical effects for the treatment of leukemia but one of the adverse effect is Graft versus Host Disease (GVHD) that causes high mortality and morbidity. Mesenchymal Stem Cells (MSCs) are one of the promising tools which are [...] Read more. Although the endothelial dysfunction is related with tumor development, there is no consensus on the suppressive or supportive effect on tumor growth. The goal of the present study was to evaluate endothelial dysfunction related factors in animal breast cancer model that was developed [...] Read more. In this study, the wound healing effect of ozonated hazelnut oil was investigated on 54 male Sprague-Dawley rats. 7 experimental groups were designed. A circular area with a diameter of approximately 2 cm on dorsal surface was drawn using a coin and full [...] Read more. Recent studies have shown that cancer cells can deceive phagocytosing macrophage cells through the CD47 protein which gives the message “don’t eat me” or “don’t kill me” to immune components. The efficacy of anti-CD47 treatment approach was shown in cancers such as, non-small [...] Read more. Psoriasis is a chronic and relapsing skin disease that affects approximately 2–3% of the world population and is considered as an inflammatory disease. Defective keratinocyte proliferation and differentiation programs, aberrant immune responses are the major factors that have been implicated in its pathogenesis. [...] Read more. Infection and chronic inflammation contribute to about 1 in 4 of all cancer cases. Emerging evidence suggests that the host factors in the tumor microenvironment may interact with underlying inflammatory prostate cancer cells to make them aggressive. In this study, we hypothesized that [...] Read more. IL-17 producing T helper 17 (Th17) cells are identified as a distinct subset of CD4+ T helper cells. They play a role in immune response. Abnormal regulation of Th17 cells can play a role in different type of pathologies such autoimmune diseases [...] Read more. The aim of this study was to investigate the anticancer activities of five chloroform extracts prepared from the aerial parts of Centeura kilaea Boiss. (CKC), C. cuneifolia Sm. (CCC), C. salicifolia M.Bieb. ex Willd. (CSAC), C. stenolepis Kerner (CSC1 and CSC2) against [...] Read more. Colchicum pusillum Sieber is a plant from Colchicaceae family that particularly rich in tropolonic alkaloids, colchicine. The aim of the study is to determine the apoptosis induction effect of Colchicum pusillum extract in Colo-741, metastatic colon cancer cells and if so, to determine [...] Read more. Helicobacter pylori, a helix-shaped gram-negative microaerophilic bacteria has been classified as a human carcinogen (Group I carcinogen) by the International Agency for Research on Cancer (IARC) on the basis of numerous animal and epidemiological studies. Chronic Helicobacter pylori infection can cause lead to [...] Read more. Metoclopramide, used as an anti-emetic drug in clinical practice, has recently also begun being used to establish hyperprolactinemic effects in the breastfeeding. The purpose of this study was to investigate the potential side-effects of metoclopramide applied in the lactation period in the central [...] Read more. Nicotine, is an alkaloid compound consisting of pyridine and pyrolidine ring. Its closed formula is C10H4N2. During smoking peak plasma concentration changes from 25 to 50 ng/mL. Its half-life is 1–2 h. Nicotine is metabolized primarily in the liver and excreted by the [...] Read more. Ewing sarcoma is a bone and soft tissue tumor either neuroectodermal or mesenchymal originated and affecting children and adolescents. In the present study, we aimed to find out prognostic and predictive biomarkers for Ewing sarcoma. Hence, we examined the copy number alterations (and [...] Read more. Anti-apoptotic Bcl-2 and proapoptotic Bax genes are the most significant genes that are involved in the regulation of apoptosis. Abnormal apoptotic activity in preeclampsia and gestational diabetes is caused by dysregulation of these genes. In this study; we examined Bcl-2 and Bax protein [...] Read more. Beta-thalassemiais one of most common autosomal recessive hematologic disorder. Alterations in the lipid profile have been reported consistent with β-thalassemia, but the pathogenesis is not clear. Genetics variations within in both the coding and noncoding regions of the PPAR-alfa gene locus contribute to [...] Read more. Although cancer research undergone a rapid expansion, there is no potential cure and the disease remains one of the leading causes of mortality worldwide. Breast cancer continues as the female malignancy and a major cause of death in middle-aged women. Calmodulin can interact [...] Read more. Mutations in the gene for fibroblast growth factor receptor 3 (FGFR3) are implicated in achondroplasia, an autosomal-dominant form of short-limbed dwarfism. The present study involves a combination of clinical exome sequencing, targeted resequencing and protein modeling methods to decipher the pathobiology of achondroplasia [...] Read more. After physical or surgical damage of corneal epithelium, most of analgesic drugs, like non-selective opioid agonists and non-steroid anti-inflammatory drugs, cannot be used because of their negative effects on wound healing process. Biphalin is selective µ and Δ opioid receptor agonist which has [...] Read more. Exposure to 3,5-dimethylaminophenol (3,5-DMAP), the metabolite of the 3-5-dimethylaniline, was shown to cause high levels of oxidative stress in different cells. However, we have shown that this alkylaniline metabolite was non-mutagenic to different strains of Salmonella typhimurium in Ames test and also was [...] Read more. Cisplatin is prevalently used as a chemotherapeutic agent for testis cancer, ovarian cancer, bladder cancer, brain tumors and many cancers such as those. Infertility and sterility may emerge, after treatment with chemotherapeutic agents, depending on patient characteristics and the dose of chemotherapeutic agent. [...] Read more. The studies on the relationship between inflammation and cancer progression have been mostly carried out with monolayer cell cultures in vitro, which can be insufficient to mimic tumor tissue. Here, we established a three-dimensional (3D) cell culture model of inflammatory microenvironment for prostate [...] Read more. In this work, we focused on the development of a novel point of care (POC) paper-based analytical microfluidic chip. The system has been developed for paper-based extraction, non-enzymatic amplification and electroanalytical detection of human papillomavirus (HPV). The device comprises paper extraction support material [...] Read more. Metal oxides have been widely used in various applications such as biomedical, commercial and environmental, due to their unique physicochemical properties. As the use of metal oxides increase worldwide, their exposure to the living systems also increases. It is therefore necessary to understand [...] Read more. Apoptosis, a programmed cell death, has a vital role in various cellular processes. Apoptotic cells exhibit morphological and biochemical changes, detected by a variety of assays (caspases, mitochondrial dyes, DNA laddering). Flow cytometry is a powerful tool for detection of apoptotic cell death [...] Read more. Parkinson’s disease (PD) is the second most common neurodegenerative disease with an estimation of 10 million people living with the disease and it is increasing in prevalence every year. Familial cases of PD are source of valuable information to determine genetical risk factors [...] Read more. Flow cytometry (FC) is a powerful and reliable system for cell death studies. It allows to study the molecular changes in both the surface and cytoplasmic part of the cells. Depending on the laser range of flow cytometry, it is possible to collect [...] Read more. Open AccessProceedings Is Irisin Anticancer Agent? Irisin is a protein, which is encoded by the FNDC5 gene. Irisin secreted as a hormone secret via Fibronectin type III domain-containing protein 5. Irisin is always provide beneficial effect of exercise on cellular metabolism as well as obesity and metabolic diseases. In [...] Read more. PTEN is inactivated in a subset of lung cancer; therefore, we investigated the involvement of PTEN inactivation in invasiveness of lung cancer cells. AKT at Ser473 was phosphorylated in several lung cancer cell lines with loss of PTEN expression. Therefore, we created a [...] Read more. Diabetes mellitus (DM) is a complex disease characterized by absolute insulin deficiency or resistance leading to hyperglycemia. Type 2 DM is caused by development of cellular resistance to insulin combined with insufficient insulin production. Type 2 DM is a common disorder causing hyperglycemia, [...] Read more. Endometrial cancer is the most common cancer of the female reproductive system. Perifosine has shown anti-tumor activity in a variety of cancers by inhibition of AKT phosphorylation. The active metabolite of vitamin D (1,25(OH)2D3) has anti-proliferative and pro-apoptotic properties and is recognized as [...] Read more. Breast cancer is the most common cancer among women and in order to create alternative treatments different types of in vivo and in vitro studies have used various plant-based therapeutic agents. Humic acid (HA) induces apoptosis and has various pharmacological properties including anti-inflammatory [...] Read more. Opuntia ficus indica L. fruit (cactus pear) seed oil is used in traditional and complementary therapies for its numerous health benefits. The aim of this study was to analyse of the fatty acid content and apoptotic induction effects of spiny and thornless Opuntia [...] Read more. Breast cancer treatments continue to be investigated with supported by new treatment methods. Melatonin is a hormone that can be effective in the treatment of breast cancer due to its anti-oxidant effect. Melatonin had previously shown to inhibit proliferation of cancer cells. In [...] Read more. Autocrine growth hormone (GH) induced cell proliferation, invasion-metastasis and drug resistance in breast cancer cells. Curcumin has an apoptotic effect on colon, melanoma, cervix, and breast cancer cells. Autophagy and endoplasmic reticulum (ER) stress are essential cellular processes activated under nutrient deprivation, pathogen [...] Read more. Curcumin, a plant derived natural compound, has anti-oxidant, anti-proliferative and apoptotic effect on various cancer cells such as prostate, colon and breast cancer. Autocrine growth hormone (GH) expression induced breast cancer invasion-metastasis has been reported in vivo and in vitro cancer models. Autophagy [...] Read more. The aim of this project was the determination of the effect of bee bread supplement in diets of obese rats on interleukin 6 immunreactivity. This study has been shown that bee bread against obesity with a high-fat diet reduces IL-6 expression in the [...] Read more. Pterygium is a benign fibrovascular proliferation that develops from the conjunctiva and invades the cornea. The etiology of this disorder remains unclear. Current treatment of pterygium is surgical. The postoperative recurrence rate of pterygium is reported be high. To the best of our [...] Read more. Pterygium is one of the most common ocular surface diseases, and characterized by inflammatory infiltrates, proliferation, fibrosis, angiogenesis, and extracellular matrix breakdown. We investigated the association of polymorphisms in the RHO genes RHOA, RHOB, RHOC, RHOD, and RND3 ( [...] Read more. Nonsteroidal anti-inflammatory drugs (NSAIDs) are commonly used as anti-inflammatory and analgesic agents. This family of drugs suppresses prostaglandin synthesis through inhibition of cyclooxygenase (COX) enzymes. Recent studies showed that anti-carcinogenic effects of these drugs are especially mediated by COX-2 enzyme. Etodolac is a [...] Read more. Lung cancer is one of the most diagnosed cancers worldwide and the development of anticancer agents for the treatment of lung cancer is an important task for researchers. For this purpose, herein pyrazoline-based compounds 1–18 were investigated for their cytotoxic effects [...] Read more. The present study investigates the total phenol amount, radical scavenging and anticancer activity of methanolic extract of Phlomis brevibracteata Turrill (PBT) leaves; an endemic plant of North Cyprus. The antiradical activity and cytotoxicity of 70% methanolic extract of PBT leaves were analyzed by [...] Read more. Open AccessProceedings Does the Inhibition of Valosin Containing Protein (VCP) Has an Effect on Apoptosis of Bone Marrow Mesenchymal Stem Cells Derived from Acute Lymphoblastic Leukemia Patients and Healthy Donors? Acute lymphoblastic leukemia (ALL) is the most common cancer type observed in childhood. Bone marrow (BM) microenvironment has significant role both at the beginning and the progress of leukemic period. Mesenchymal stem cells (MSCs) that make up microenvironment, regulate growth factors, cytokines and [...] Read more. Open AccessProceedings Which Medium and Ingredients Provide Better Morphological Differentiation of SH-SY5Y Cells? Human SH-SY5Y cell line has been used as an in vitro model in neuroscience research. However, many researchers emphasized that there are many differences between differentiated and undifferentiated characteristics of SH-SY5Y. Although Retinoic Acid (RA) generally have been used for differentiation of SH-SY5Y [...] Read more. OGG1 (8-oxo-G DNA glycosylase 1) is a BER (base excision repair) enzyme responsible for the repair of 8-oxo-G base damage related to oxidative stress through glycosylation. Determination of the interaction of DNA repair enzymes with other proteins that contributes to repairing base damages [...] Read more. Glioblastoma is the most common high-grade brain tumor in adults, which has a rapidly developing radiotherapy/chemotherapy resistance and high recurrence rate. The aim of our study is to determine the effects of bortezomib that is a quite important proteasome inhibitor on glioblastoma tumors [...] Read more. Prostate cancer cells need androgens to grow and maintain like normal prostate cells, both utilize that Androgen Receptor (AR) function. Androgen receptor (AR) is expressed throughout the prostate cancer progression plays a critical role as a transcription factor in castration-dependent stages of disease. [...] Read more. Increased neopterin levels reflect the activation of the cellular immune system which is of importance in the pathogenesis and progression of various diseases such as cancer. However, the effects of neopterin on the biological activity of Hepatocellular carcinoma cells are not yet illuminated. [...] Read more. Open AccessProceedings Is Oxytocin Proper for Cancer Adjuvant Therapy? Neuroblastomas are solid tumors and mostly seen in the adrenal medulla and sympathetic ganglia. It is known that neuroblastoma cell proliferation is inhibited by cisplatin and vincristine. The aim of this study was to investigate the effect of oxytocin on cell viability in [...] Read more. The ubiquitin proteasomal system and autophagic pathway are two main protein degradation systems in eukaryotic cells. Inhibition of the proteasomal system with proteasome inhibitors for cancer treatment can cause neurotoxic side effects. In this study, we investigated neurotoxic side effects of bortezomib (BTZ) [...] Read more. Undesirable side effects that result from the random use of herbicides in developing countries are widespread. Imazamox is a widely used herbicide and has toxic effect on humans. Momordica charantia has been reported to possess many benefits and medicinal properties. Pycnogenol (PYC) is [...] Read more. Technological devices such as mobile phones, wi-fi and bluetooth applications used widely in daily life emit low-dose electromagnetic fields (EMFs). EMFs influence metabolic processes in the body and exert various harmful biological effects on cells. This study aims to evaluate acute and chronic [...] Read more. Cervical cancer is one of the frequent types of cancer seen in females. It has been suggested that natural compounds can be used effectively for cancer treatment. Apoptosis and autophagy related cell death play important roles in suppression of tumorigenesis. Apigenin and curcumin [...] Read more. Cyclophosphamide (CTX), also known as cytophosphane among other, is a medication used as chemotherapy and to suppress the immune system. The PI3K/AKT/mTOR pathway is involved in the regulation of diverse cellular functions, including cell growth, protein synthesis, cell cycle regulation, glucose metabolism, and [...] Read more. Lung cancer, among all cancer types around the world, is listed as the major cause of death with high mortality rate. ERG transcription factor has an important role in the Epithelial Mesenchymal Transition (EMT), which is one of the most important mechanisms in [...] Read more. Lung cancer is listed as the most fatal type of cancer around the world. ERG, a transcription factor, is an ETS family member protein. It is involved in Epithelial Mesenchymal Transition (EMT), metastasis and DNA repair defects. Etoposide is a chemotherapeutic agent used [...] Read more. Genetic alterations affect carcinogenesis, and recent studies demonstrated that long non-coding RNAs (lncRNAs) have critical roles during this process. Hox transcript antisense intergenic RNA (HOTAIR) is a lncRNA molecule that affects proliferation, survival, migration, genomic stability, and drug resistance of cancer cells. The [...] Read more. Neuroblastoma is an embryonic tumor originating from the neural crest. It accounts for 8–10% of all childhood cancers. Although Cisplatin is used in neuroblastoma treatment, it has many side effects, such as ototoxicity, nephrotoxicity, and neurotoxicity. One herbal agent that has attracted attention [...] Read more. Bone marrow mesenchymal stem cells (BM-MSCs) are used to repair hypoxic or ischemic tissue. After hypoxic the level of ATP is decreases, cellular functions do not continue and apoptosis or necrosis occur. Apoptosis is a progress of programmed cell death that occurs in [...] Read more. Among chemotherapeutic agents, cisplatin and the other platinum-based drugs have occupied for 35 years an enviable position. The limitations of platinum-based drugs, dose dependent side effects and development of drug resistance mechanisms, have boosted the research for finding other metal-based drugs. Among metals, [...] Read more.